There are a lot of moons in our solar system—175 major planet satellites, and three times that if you count every natural satellite of every known object (like asteroids)—but among them our own capital-M Moon is in many ways unique. At a full quarter the size of Earth, only Pluto has a moon so near in size to itself, and unlike the swarms of icy worlds orbiting the gas giants the Moon is oddly very similar in composition to Earth…so similar, in fact, that it’s been casting increased doubt on the accuracy of the best-accepted model of the Moon’s formation, namely the Giant Impact Hypothesis. 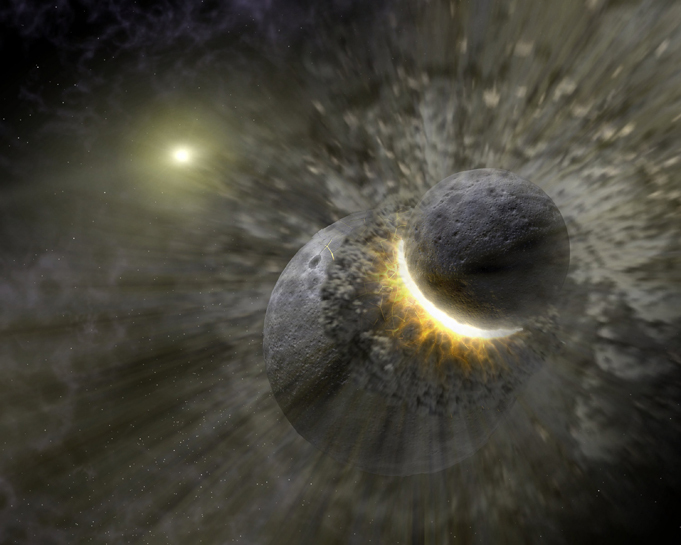 Suggested in 1975 by planetary scientists William K. Hartmann and Don Davis, the model claims that the Moon was created 4.5 billion years ago when a Mars-sized world that’s been named Theia impacted the newly-formed Earth, blasting a chunk of molten material out into orbit that solidified to form the Moon. The model is based on a lot of science and answers a lot of questions, but not all—including a key issue of why the Moon today appears compositionally identical to Earth and not a mixture of Earth and a completely different planet. As advanced computer measurement and modeling capabilities have increased a new wave of researchers are tackling the conundrum of the Moon’s origins, and a few new scenarios are coming to light. While ancient impacts are still involved, the question is now how many? With what kind of world(s)? And what exactly happened after the event? Next Post It’s Cassini’s Final Month.